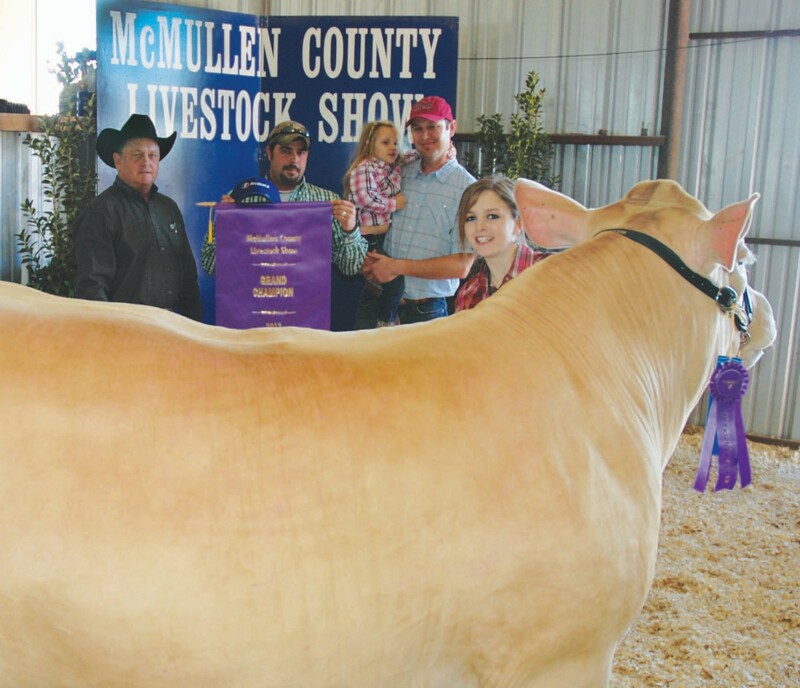 The McMullen County Stockshow was held this past week with record breaking donations. Ashley Lewis’ Grand Champion Steer was purchased for $10,000. Pictured are Jody Johnson representing Strike Construction; Carlos Riojas with Talisman Energy USA, Elle Leavett, Lucas Leavette with Quintanilla Management Co. Please see more results on page 8A and in the Farm & Ranch section C.
The 2012 McMullen County Jr. Livestock Show and Auction had a tremendous event despite any slump in the economy. This year’s auction rose above the marks set in any other previous year. Organizers considered 2012 not just “a pretty good year,” but an awesome — record breaking year. The grand total at the 2012 auction reached $275,600 — beating last years sale by almost $83,000. The record-setting sale previously set in 2009 with a total of $236,300 was crushed. This year’s sale included 87 animal projects — up from 86 exhibits in 2009. The price (average) per animal this year reached $3,168. The 2012 Grand Champion Swine, entered by Tyler Gunter – her second year –and brought another record amount $8,500 — from syndicates – School House, San Miguel and Atascosa, along with Chesapeake Energy and Atascosa National Bank. Exhibitor Joaquin Cavazosraised the 2012 Grand Champion Lamb. The animal sold this year to John Barnes Contracting for a recordbreaking $8,000. In the goat division, Charlsie Harris exhibited the 2012 Grand Champion Goat, which sold for a record price of $7,000 to Esse-Woelfel Ranches. The 2012 Grand Champion Broilers were exhibited by Donnie Soward, which sold to the group made up of Rancho Saylee for a bid of $7,000. Michele McCartney showed the 2012 Reserve Champion Steer. Her animal sold for $7,500 to the Atascosa Syndicate, San Miguel Syndicate and the School House Syndicate, along with Chesapeake Energy and Atascosa Livestock Exchange. The 2012 Reserve Champion Swine, exhibited by Cotton Harris, sold at this year’s auction for $5,750 to BottomLine Services, School House Syndicate and Chesapeake Energy. The 2012 Reserve Champion Lamb sold at auction for $5,500 to the Donnell Family. The animal was raised by Sarita Cavazos. In the goat division, the 2012 Reserve Champion Goat was exhibited by Hillary Gillin. Her animal was bought by Macy’s Rentals, Strike Construction, Talisman Energy USA, Quintanilla Management and Q-Haul for $6,500. The 2012 Reserve Champion Rabbits sold for a price of $5,000 to the First State Bank, Three Rivers. The 2012 winning rabbits were raised by Mariah Mesa. Champion animals was the division for broilers. Nolan Barnes raised the pen of 2012 Reserve Champion Poultry (Broilers). This years pen of broilers sold for $6,500 to S&S Equipment, Chapa Gate Guard Service and Premier Eagle Ford Energy Services. Cayden Turner – Swine -1 – Light – $3,500 – Chesapeake Energy / Schoolhouse Syndicate / BottomLine Svcs. Colton Gonzales – Goats-3 – Medium – $2,750 – Talisman Energy USA / Strike Construction / Quintanilla Mgment. Jasmine Garcia – Goats-6 – MedHvy – $2,000 – Zella Cattle Co.
Ashely Lewis Beef HvyGrand $10,000 Strike Construction / Quintanilla Management Co.
Cayden Turner Swine -1 Light $3,500 Chesapeake Energy / Schoolhouse Syndicate / BottomLine Svcs. Colton Gonzales Goats-3 Medium $2,750 Talisman Energy USA / Strike Construction / Quintanilla Mgment. Jasmine Garcia Goats-6 MedHvy $2,000 Zella Cattle Co.